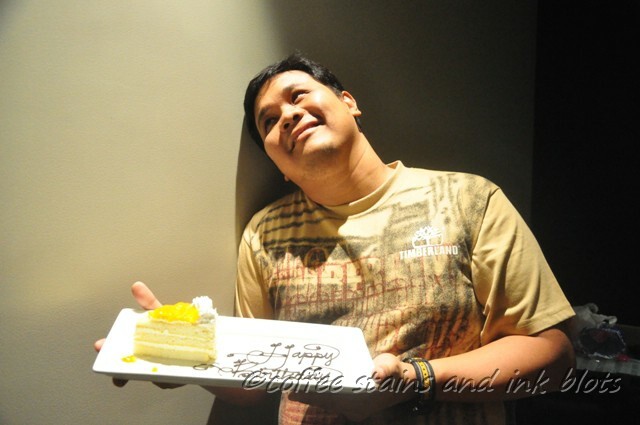 for hubby’s birthday celebration this year, i got a voucher for an overnight stay at acacia hotel from deal grocer. 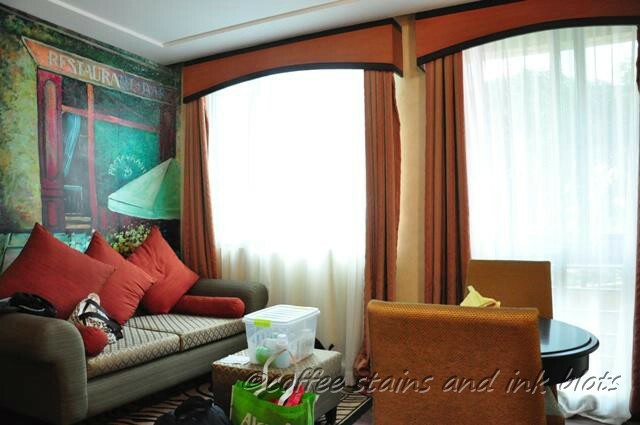 for php 4000.00, the deal was for an overnight stay in a deluxe room inclusive of buffet breakfast for two. you will also be allowed to use the hotel’s facilities like the swimming pool, and also avail of the free shuttle around alabang area. we arrived at the hotel at around 3pm. 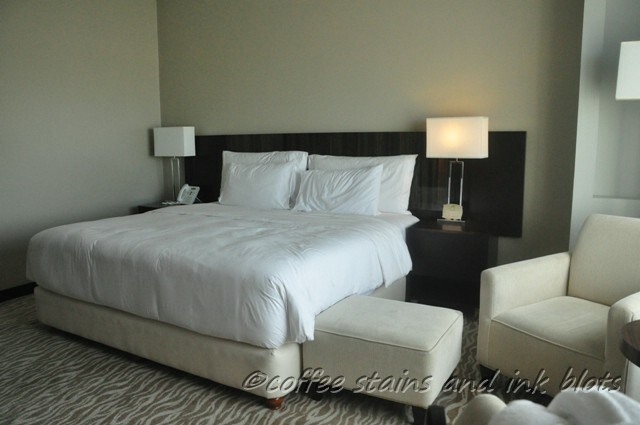 after checking in and having our welcome drinks and snacks, we were ushered into our room. the room was very spacious and i like the way the natural light comes into it. in the center was a very comfortable king sized bed. there was also a reading chair, a working desk, minibar/ref and of course the television set. 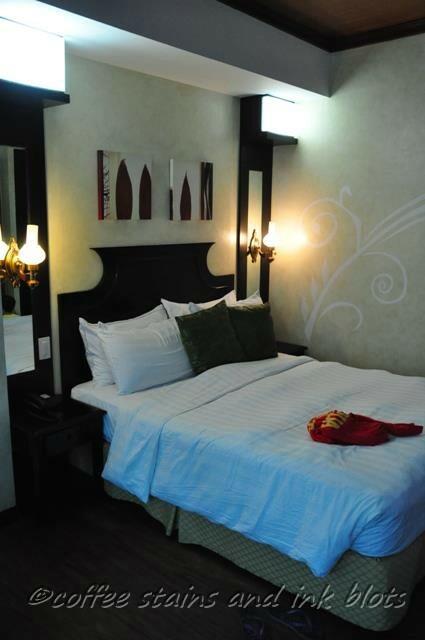 acacia hotel boasts of the “pillow concierge” wherein you can choose a particular type of pillow based on your needs. the “menu” is available inside the room, and you can just call housekeeping if you want to change your pillows — they have latex, microgel, aromatherapy and fiber. for us, we were already contented with the fiber pillows in our room. we also had complimentary internet access, and it was very fast and reliable. 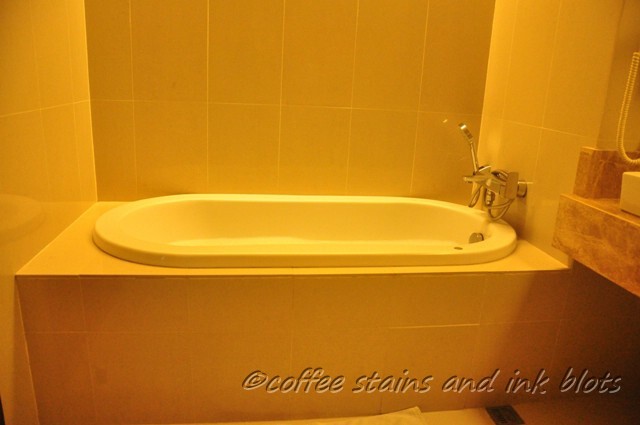 the toilet and bath was also of considerable size. there was a separate shower area, a toilet and a bath tub which was already filled with water and bathgel, ready for you to use. my son enjoyed taking his bath in the tub. toiletries were also provided. their quality and scent of their line was ok. my only complaint is the packaging since it was a little bit hard to squeeze the product out especially when my hands were already slippery due to soap. as mentioned, we were able to use of the shuttle service to and from alabang town center where we had our dinner. i also availed of the in-room massage which was very relaxing. the next morning, we had buffet breakfast at their restaurant acaci. 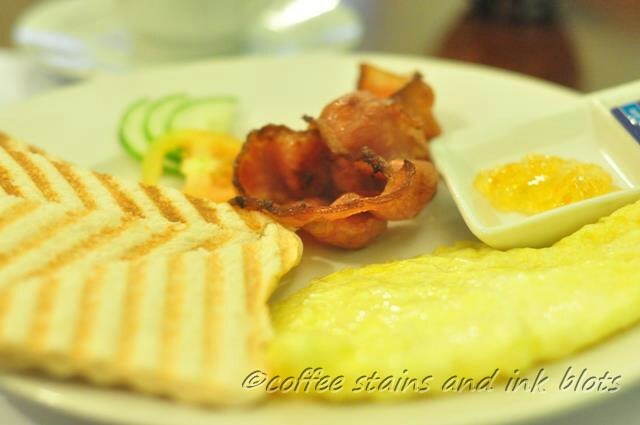 the breakfast spread had varied options, and i can say that i was satisfied with how the food tasted. i had soup, omelet, bacon, sausages and some breads. there were also fruits, salads, cereal and other staples for breakfast. (we were just unable to take photos during breakfast… sorry). 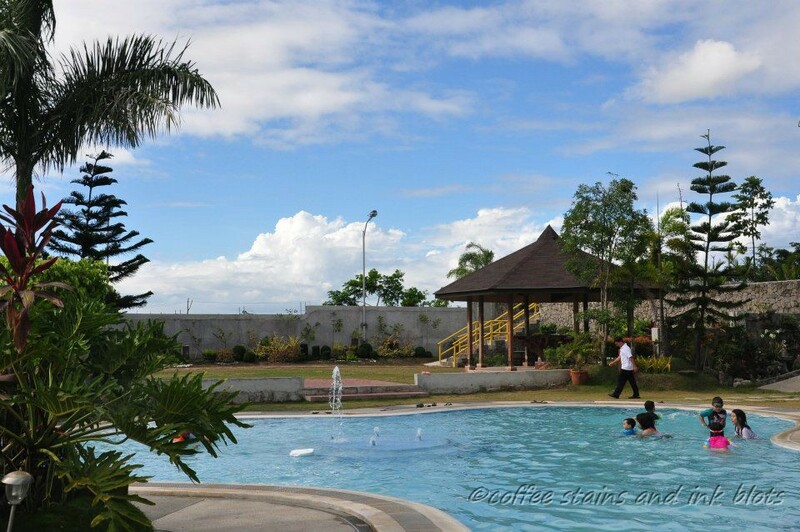 after breakfast, we went to the pool area where hubby and my son spent some time swimming and playing in the pool. it was a little chilly given that the pool is at the third floor, and it was january. 🙂 we were also offered glasses of iced tea while we were in the pool area which i enjoyed while lounging around. i would say that it is definitely worth your while to stay at this hotel. they have good facilities – even the design and interior of the building is nice and impressive. 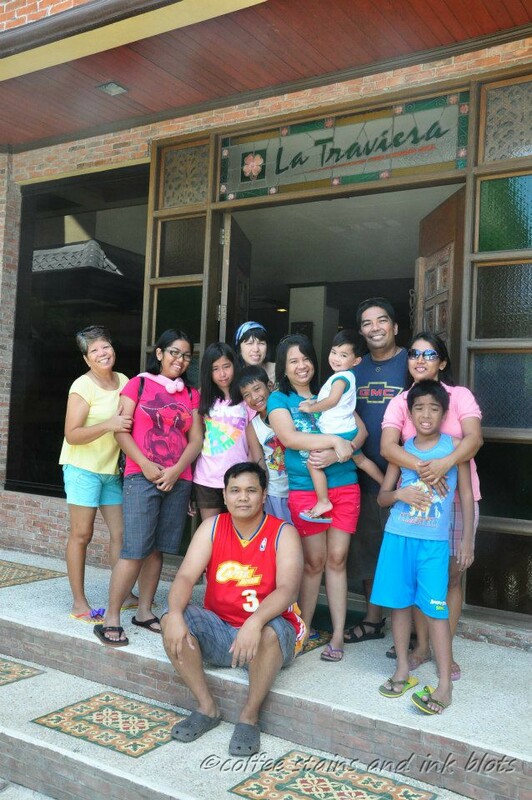 service was superb – they are true to their offering of “filipino hospitality at its best”. they are always ready to help and please, and give you whatever it is that you might need. rates are also very competitive. for our holy week escapade last year, i got a voucher from ensogo (now living social) for an overnight stay at la traviesa. the voucher included an overnight stay for 8 adults in an attic room, plated breakfast and use of their facilities. it was good that the voucher is valid even though we used it during the holy week holidays. usual check-in and check-out times were followed. we arrived at the resort at around 3pm. 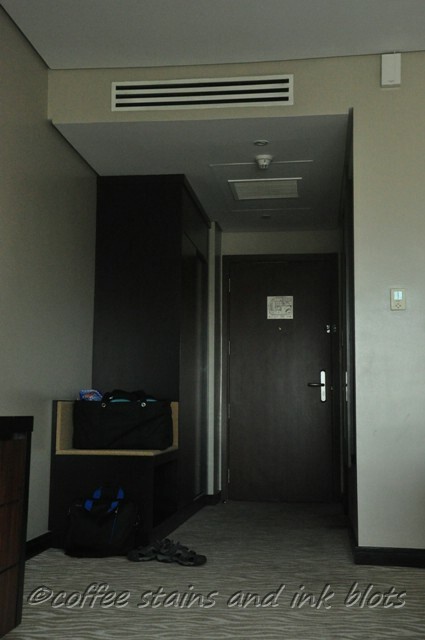 after the usual procedure for checking in, we settled into our rooms. the attic room was very spacious. there were a total of 3 double beds + 1 bed with a pull out. 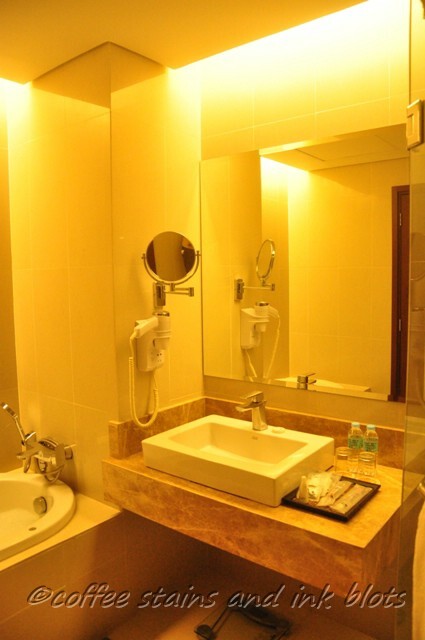 the room also included a toilet and bath plus a personal refrigerator, lcd tv and phone. we had 6 adults + 3 children occupying the room. after getting our things in order, we settled ourselves in a cottage near the pool where we had our food. the resort was not strict in bringing in of food and beverages. we even bought our iwatani portable stove with us so that we can cook and reheat our food. after eating, everyone proceeded to hit the pools. the resort has a separate kiddie pool and an adult infinity pool. most of us swam until around dinner time. after dinner, a number of us tried out the services in their spa. i availed of the package which included a body scrub + massage for php 1200.00. the spa facility was nice and relaxing, and the therapists and staff were very courteous and helpful. they even provided us with disposable underwear for our treatment. the scrub and massage was thorough and soothing, and i enjoyed it. 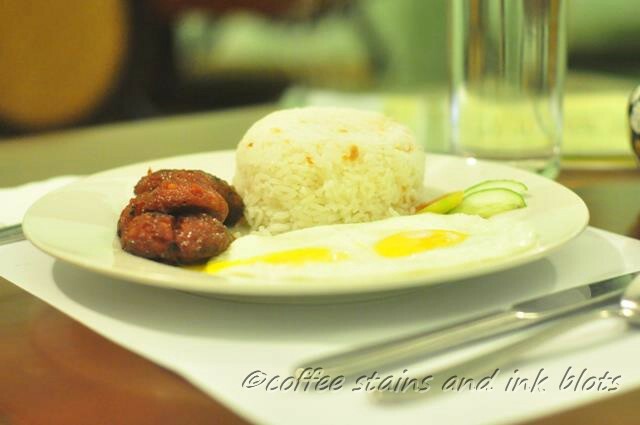 complimentary breakfast was plated, and the choice of filipino or american breakfast. we ordered the tocino, tapa, bangus and bacon. it came with either coffee or hot choco. breakfast was served in our room. service was a little slow as we had to follow up several times before our food was served even though we already called in our orders the night before. the coffee and hot chocolate (which all came in instant sachets) took even longer that most of us were already finish eating when it arrived. after breakfast, the kids hit the pool again until it was time for us to fix ourselves and our things and check out of the resort. overall, i would say that we got the value of what we paid for. 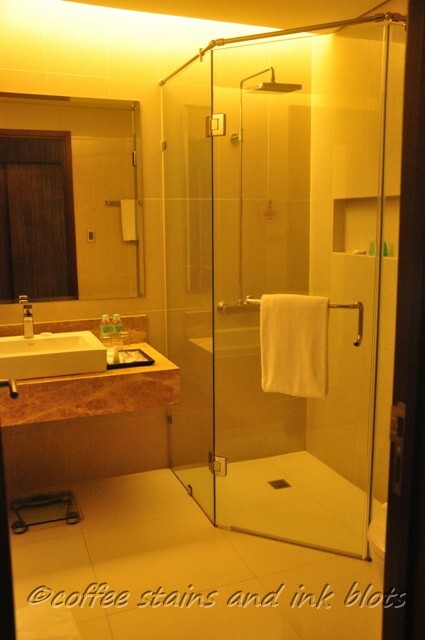 the resort and its facilities were good but it could still be improved a lot, especially on the service. anyone who is looking for a quick family getaway, or even just for day swimming, i would recommend going to this resort. whenever we have the time and budget, we always do a quick getaway somewhere to recharge and refresh. 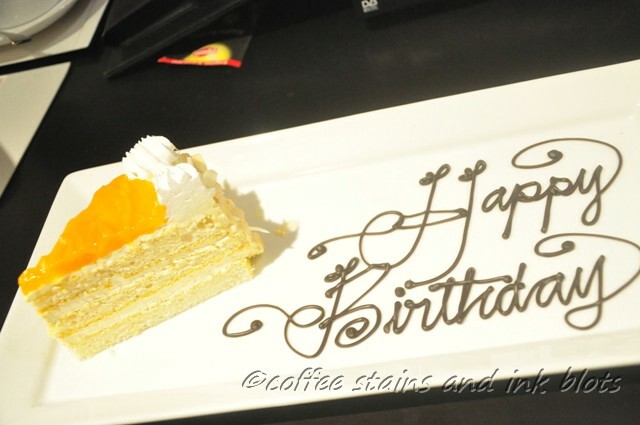 it usually coincides if we are celebrating something like birthdays or anniversaries. 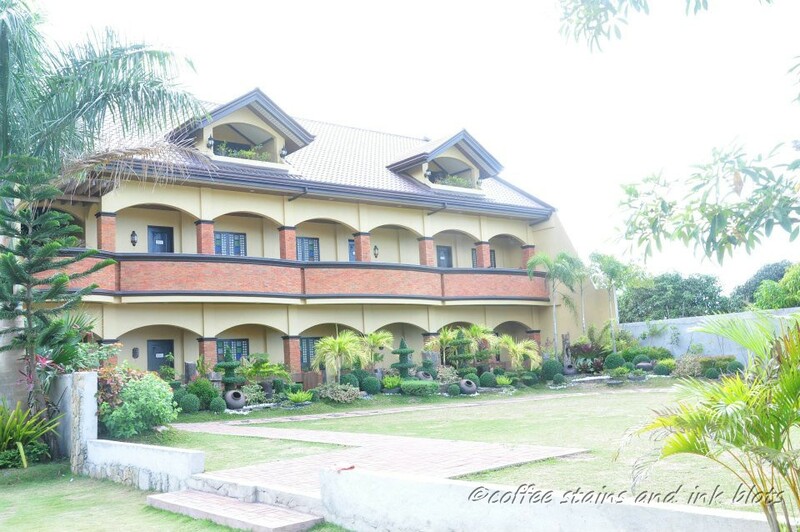 tagaytay is one of our go to places since it is just an hour drive from us. using a voucher that was purchased through ensogo (now living social – one of the online group buying sites), we decided to head to Lee Boutique Hotel for our anniversary weekend last 2012. Lee Boutique Hotel, the city’s first Euro-Asian fusion hotel, provides lodging in the heart of the city. It features large guestrooms and suites, as well as a viewing deck where one can catch a breathtaking scene of Taal Volcano. 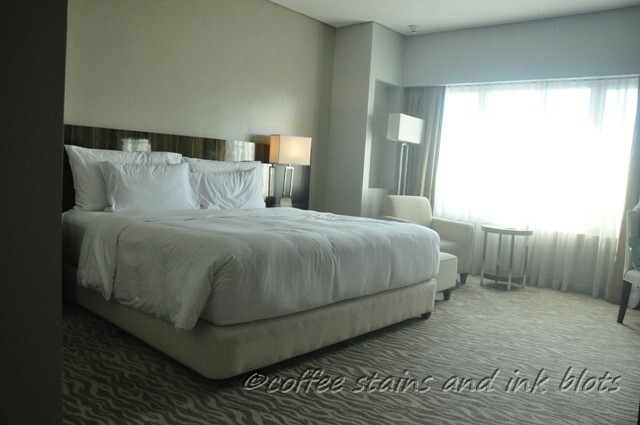 the voucher was worth php 3000.00 which included a 2d/1n stay in a superior room plus breakfast. the room was nice. it was quite spacious that it even has a small living area with a sofa and a small dining area which could seat 2 persons. the wall paintings and room decor was also tasteful. 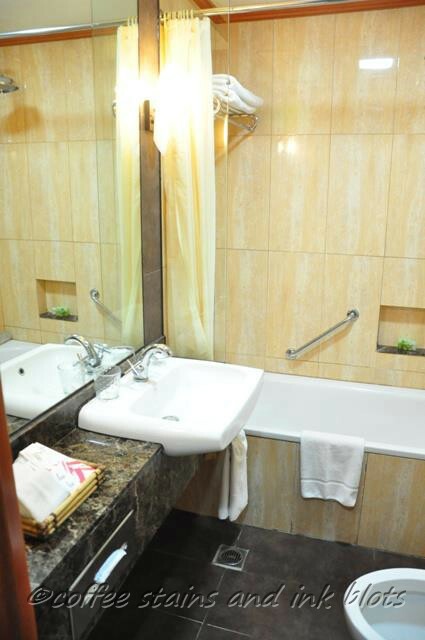 the bathroom has a bathtub with shower and complete set of toiletries were also provided. the boutique has an in-house restaurant called oui drink tea eat rice located at the basement. based from our stay, this is where the improvements should be made. since the location is in the basement, the atmosphere seems a little sad especially when there are not too many people. you will also have a hard time calling for a waiter since they are not always around. the food is mediocre. you can find better food somewhere else. for convenience, we had our dinner here during our first night, and we were not satisfied (as you can prove with the lack of pictures). for the complimentary breakfast, hubby got the filipino breakfast of longanissa and i got the american breakfast of bacon and toast. as you can see in the picture, the serving was quite small and it looks unappetizing. the meals come with a cup of coffee which was instant. overall, i would say that the service and the room was alright, but it was with the food that i have some reservations. since our stay here was more than a year ago, i really hoped that there have already been some improvements most especially with the food so that more people will be encouraged to stay here as they will no longer to go outside to look for a restaurant to eat at. most especially, the complimentary breakfast could be a deal breaker. as we all know, most b&bs and hotels offer breakfast with their accommodation so this could be a deal breaker if the food served is unsatisfying.